Over a period of about thirty years or more I have followed a variety of musical paths as a singer, starting with American folk, stopping at jazz, hopping the world music train, and engaging in my own songwriting. For almost thirty of those years I have been compelled to pick up and play the kantele. I have performed and given kantele workshops in old tin sheds, Temperance halls, cow fields, old school houses, churches, libraries, museums, log palaces, and American and Canadian Universities. Why do it? Playing a kantele is a perfect instrument for a shy person. I like that the sound of a kantele rings out, but hovers at the edge of things. There is a Zen saying – catch the vigorous horse of your mind. When I play the kantele, something inside me slows down. I care, and I let go my cares. 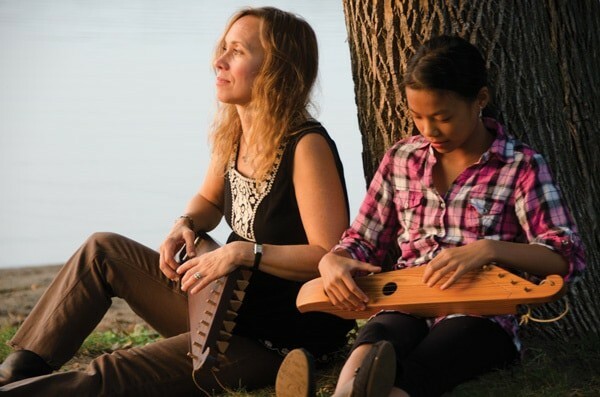 I met my first kantele through my mother. She bought it through an ad in a suburban newspaper. The instrument had been in a family with six children who it seemed took many turns trying to play it as children are apt to do when met with large objects that make sound. It had 36 strings with a long, smooth curving body. The sound it produced was not so much song as smoker’s hack. I was told that maybe it was a Kilpinen kantele. It sat collecting dust for years until a group of generous experts, both Finnish-Americans and Finns, gathered around it and figured out how to glue, re-string and re-tune it into a working instrument again. And the sound was deep, old and mellow, a sound of shadows and rivers. The instrument could possibly be over seventy years old. It definitely has that low, wise voice of experience. When I play it, I hear a shimmer of ancient bells. Before my mother’s kantele regained its sound, I found myself on a path that led me to learning smaller kanteles. I learned to play the five and ten-string with a group of people in Minneapolis who all seemed to share the same desire; make music and connect with that Finnish part of ourselves that swirled in our DNA. They were the kantele group, Koivun Kaiku, founded by Joyce Hakala. Through the group I was introduced to a whole host of tunes that I never knew existed, yet they resonated inside me in a way I can’t really explain. I studied briefly at the Sibelius Academy. I did my best trying to learn kantele in German from Martti Pokela. He was too shy with his English and my Finnish was next to hopeless. Still he encouraged my attempts to reproduce songs from his books. We both knew my interpretations were a distant approximation, still he would commend me on what he politely called my “innovative” way of playing. When I sat down with Toivo Alaspää I always felt I needed to strap in. It was often fast and furious and I was always trying to catch up, and only sometimes succeeding. So I would stop, flip on my tape recorder and watch the bound together notes from what looked like the easy resting of his hands. Our conversations often included his offering me the saltiest salmiakki and my difficult smile while I tried not to wince. Studying with masters is always humbling. I came away with much gratitude at the opportunity to watch and listen while they conjured sounds both ancestral and modern. I like to watch how American children pick up the instrument like it was a clock and wonder at how it works. And how those in nursing homes hold it in their laps like a small child. It’s a wooden hollow that they can ring like a bell. It’s a bit of sun that lights in the hand. For me playing a kantele is a mysterious undertaking, something that pulses in my bones long after I have played a song. I taught kantele for almost a year in the community of Cokato, not far from Minneapolis, that is one of the earliest settlements of Finnish immigrants in Minnesota. I asked my younger students what they thought the kantele sounded like. They scribbled ideas on the chalkboard. Here are a few things they said: someone singing, funny, ice cream, bells, soft, cuckoo clock, great, Bobby McFerrin, owl, harp, chimes, good, magic, loveable music. I concur. I have accumulated a few different kanteles over the years. Some made in Finland, some made by my good friend Gerry Henkel of The Kantele Shop. I haul one out when I need that certain fix only a kantele can provide. And now my daughter LiLi joins me. There are not many opportunities when an 11-year old can teach adults how to do something. It’s a good thing to see that reversal of roles when she teaches someone how to play. So now she is also a part of a Finnish musical lineage. The Finnish poet, Jouni Inkola says in his poem Genealogy, “Everything in me is a contagious debt and my heart has nothing to pay it with, since the echoes of its pulse cannot go backwards.” I can’t go backwards to my Finnish ancestors, they remain in so many ways a mystery and in some ways a loss, but I can try to make some music that maybe pulses with something we share. All of my recordings have had some kantele on them. In addition to vocals, my new CD, bittersweet, has a bit more kantele tunes on it than my previous recordings. There are little tunes on it written for my mother, for snow, for Ilmatar who sweeps the dance floor, for Multia, where my grandmother lived before she emigrated, for sparrows and for Chinese tea. I hope the recording conveys how a Finnish-American woman looks with a musical lens at her heritage, how that heritage haunts her, how for her it is both bitter and sweet.